Sutton Allen. Catiline. Oil & mixed-media on canvas. Sutton Allen, a junior art and design major, was recently published in the peer-reviewed Journal of Undergraduate Research and Creative Activity (UReCA). Allen works primarily in oil and his current series explores iconography and images of antiquity. 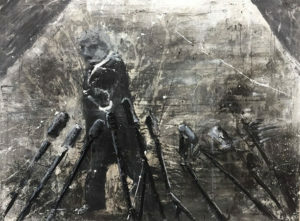 One of his published pieces, “Catiline,” features an abstract depiction of president Trump surrounded by microphones that was inspired by a photograph he saw in The New York Times. Looking closely at Allen’s work, one can see the multiple layers that he meticulously applies and the various experimental effects he utilizes in order to generate his desired outcome. “This body of work was very much experimental. The only controls I used were the canvas and the paint,” said Allen. “I did not want to be restricted by limitations or traditions so I chose to use a lot of non-traditional materials.” Allen first applied a layer of oil paint and then followed up with non-traditional materials like plaster, spray paint, and various chemicals.